The apartment building welcomed its first residents Nov. 1st. We took a look at the all-but-finished product on the eve of its one-month anniversary. 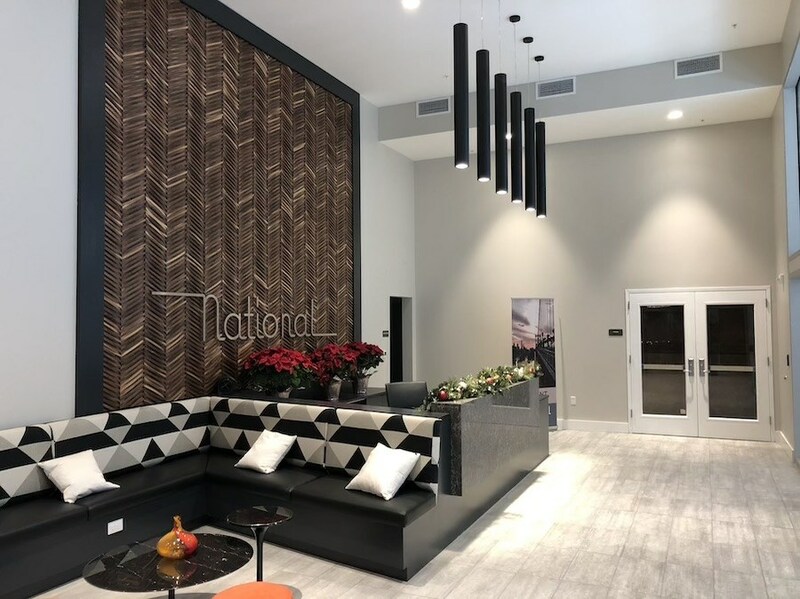 The Buccini/Pollin Group’s (BPG) first residential project in Philadelphia, The National, opened its doors to its first residents on Nov. 1st. 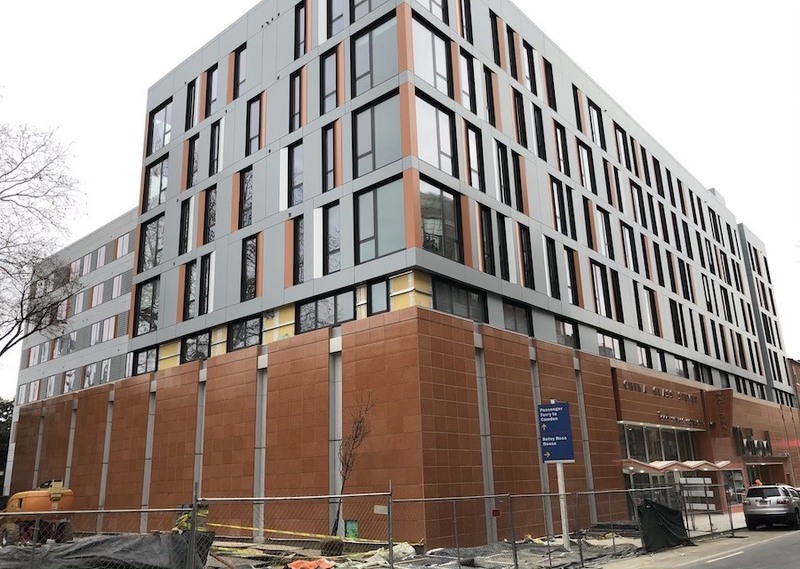 The much-discussed project puts 192 apartments, 4,000 square feet of retail space, and underground parking for 60 cars on the site of the former National Products Company, a distributor of restaurant equipment and supplies. 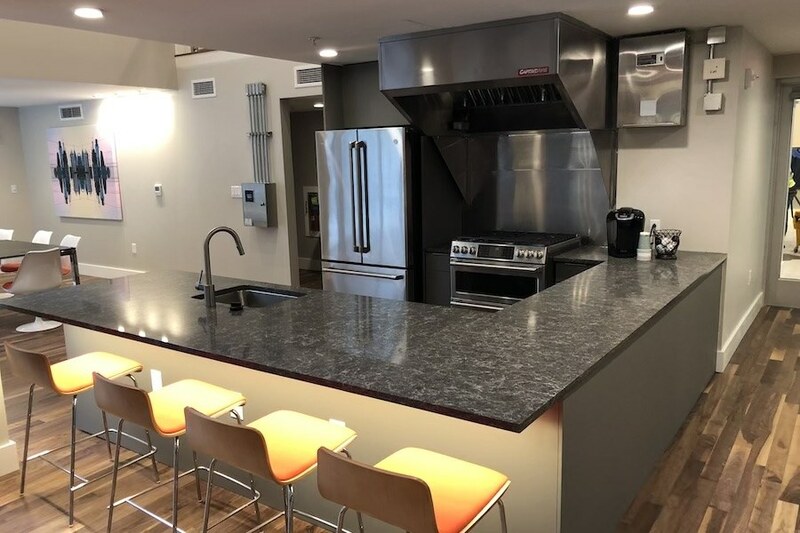 On the eve of the second wave of move-ins, Boris Kaplan, vice president of Wilmington-based BPG, invited Philadelphia magazine in for a look around the property. 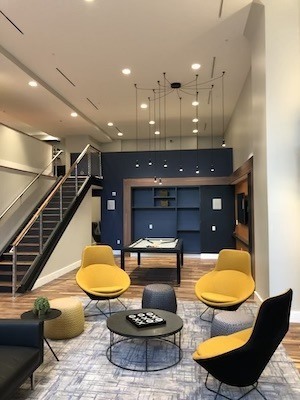 The finishing touches were still being applied to some of the interior spaces, in particular the street-floor retail space where Level 1 Fitness will set up shop next month. And none of the outdoor spaces were ready for use, but as winter is at our doorstep, having these facilities ready now is not so critical. 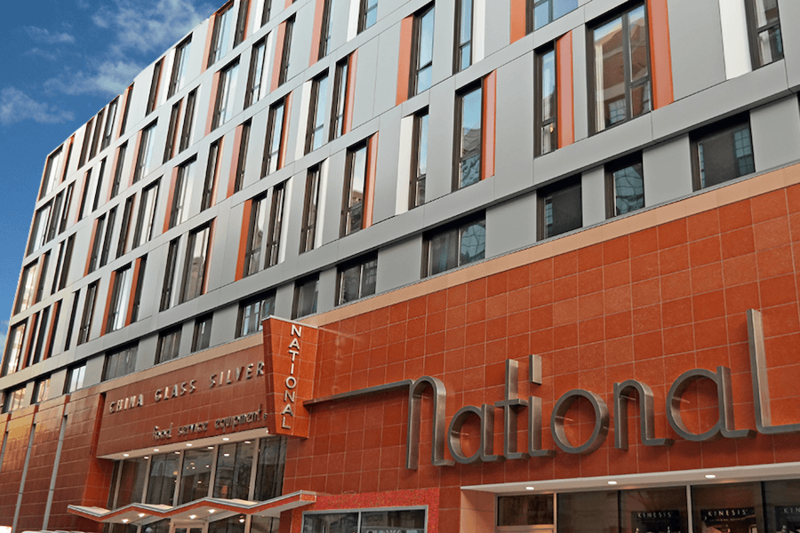 The all-new building, designed by Barton Partners, replaces a hodgepodge of 19th- and early-20th-century buildings that together housed National Products. When BPG determined that incorporating the existing structures into its project was neither feasible nor practical, it agreed to local preservationists’ requests to preserve the old buildings’ unifying Midcentury Modern terracotta facade. As it turns out, most of that painstakingly restored facade is all-new too. The brushed aluminum door handles on the front door and the granite spandrels between the tiles are also original. Behind the facade, however, the architects and construction crew had a blank slate to work with. What the architects produced is a C-shaped building with a uniform six-story height. The top and bottom of the C envelop an interior courtyard that will be landscaped for residents’ use. The parking spaces lie beneath the rear wing and courtyard, with a garage entrance on Arch Street. “Less than half of the residents will have cars in this building,” Kaplan says confidently. He acknowledges that some residents who work in outlying areas such as South Jersey or Wilmington will choose to drive because the building is convenient to I-95 and the Ben Franklin Bridge. But most of them, he says, will want to take advantage of The National’s highly walkable location. Also on the outside are a smaller courtyard accessed from the first-floor apartments and the clubhouse; it’s separated from Flagpole Park, the gateway to Elfreth’s Alley, by a wall. And atop the building will be a roofdeck with a bar, grills and great city views. 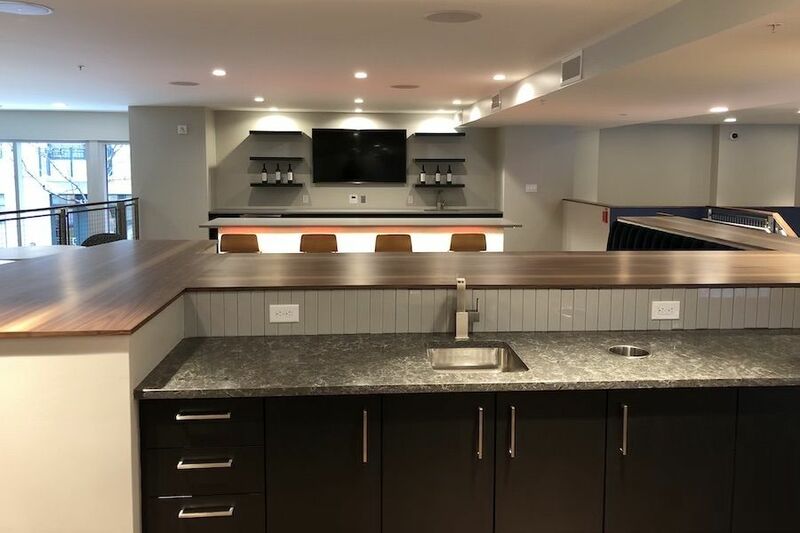 On the inside, all the residents will have use of a two-story, 2,000-square-foot-plus clubhouse. 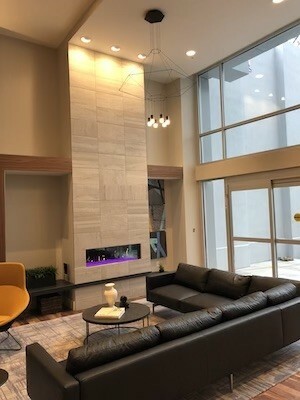 This space combines a contemporary lounge with full-height gas fireplace, a restaurant-quality demonstration kitchen, and an upstairs lounge with cocktail and breakfast bars. They will also have use of a top-flight gym thanks to an arrangement between BPG and Level 1 Fitness, which will occupy all 4,000 square feet of retail space in the building. The deal allows residents to use the Level 1 gym, which is also open to the public, for a significant discount off the regular $69 per month fee. Kaplan explains that this arrangement gives residents access to higher-quality and more extensive gym facilities than an in-house fitness center would offer. 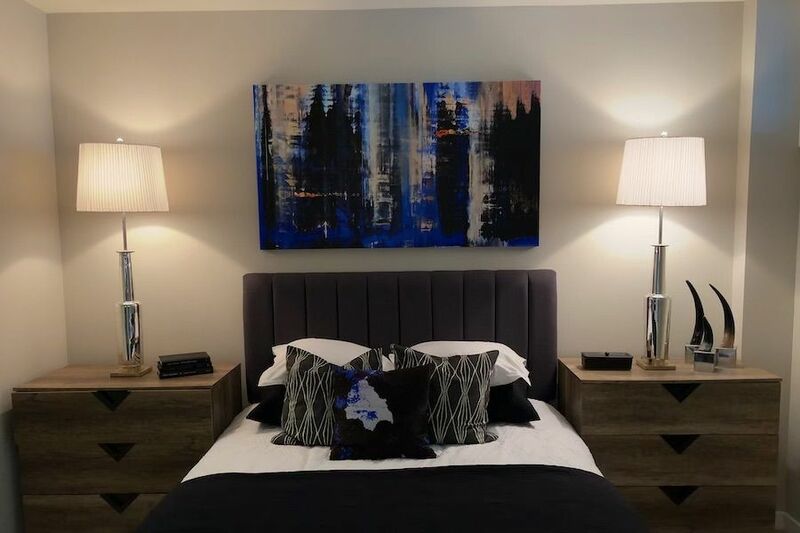 Model one- and two-bedroom apartments, seen here, are also open for inspection. Kaplan says that BPG expected greater interest in this building from larger households when the plans were being drawn up. 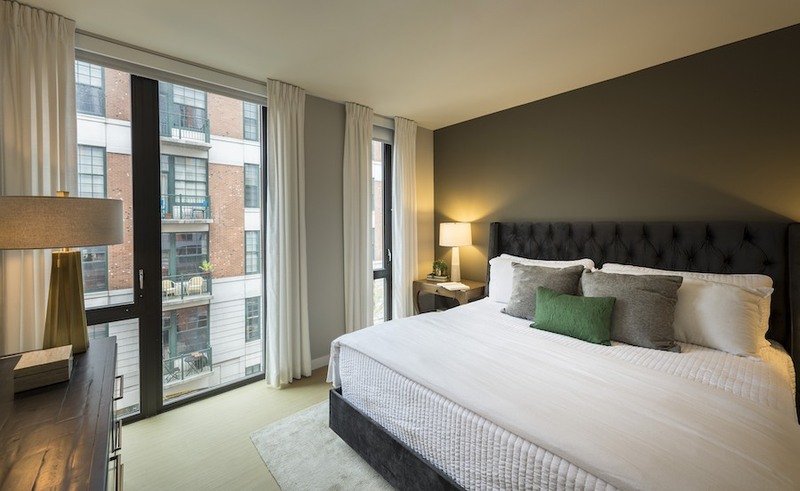 As a result, fully 30 percent of the apartments have two bedrooms. 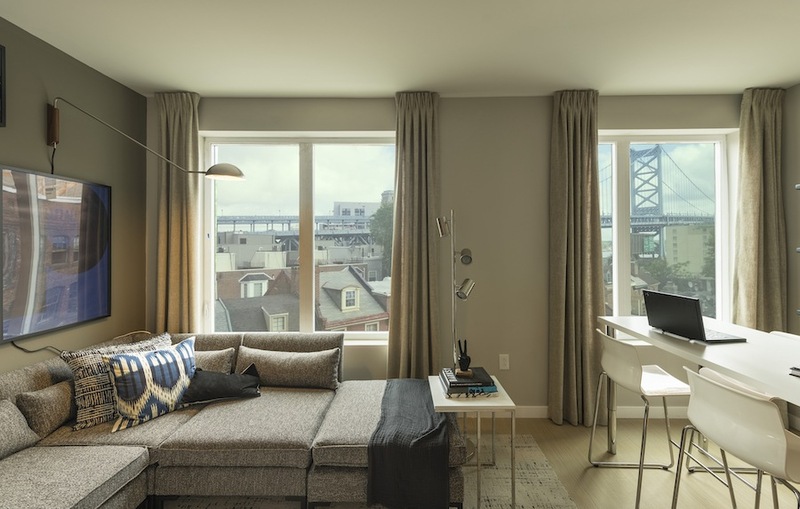 The model one-bedroom unit looks out on the Ben Franklin Bridge. 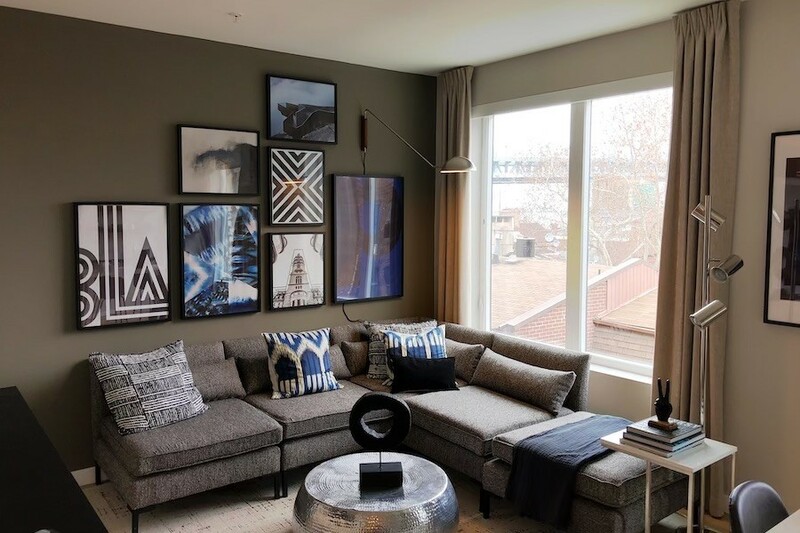 One-bedroom units account for the largest share of the total, 60 percent, with the remaining 10 percent consisting of studios. 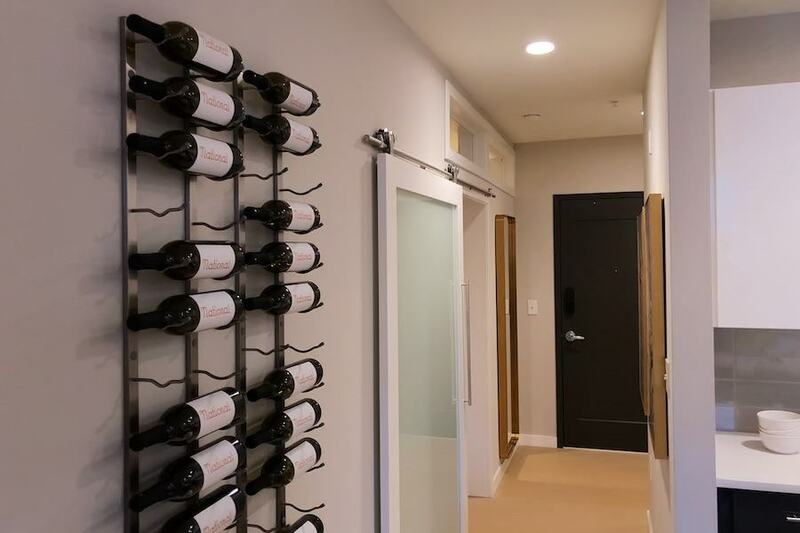 The model two-bedroom unit’s master bedroom has a large walk-in closet. The model two-bedroom unit’s living area. BPG is also giving Flagpole Park a makeover, following a design produced by community residents working with the Community Design Collaborative and a team of designers from Old City-based Land Collective. “It’s designed to serve as the transition between the historic street and this much larger building next to it,” Kaplan says. 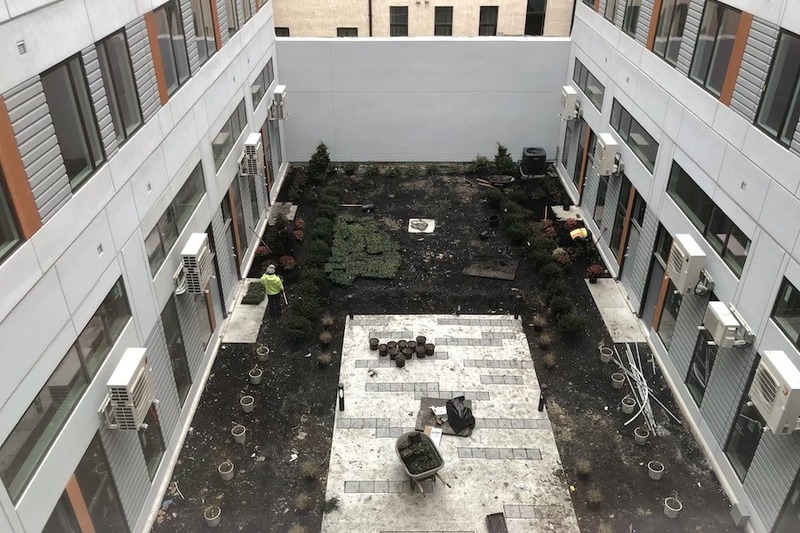 In the near term, the former asphalt parking lot will become a patch of grass; the plot will ultimately become a pocket park with more substantial landscaping and hardscaping. Kaplan expects the new park will be ready later in 2019. 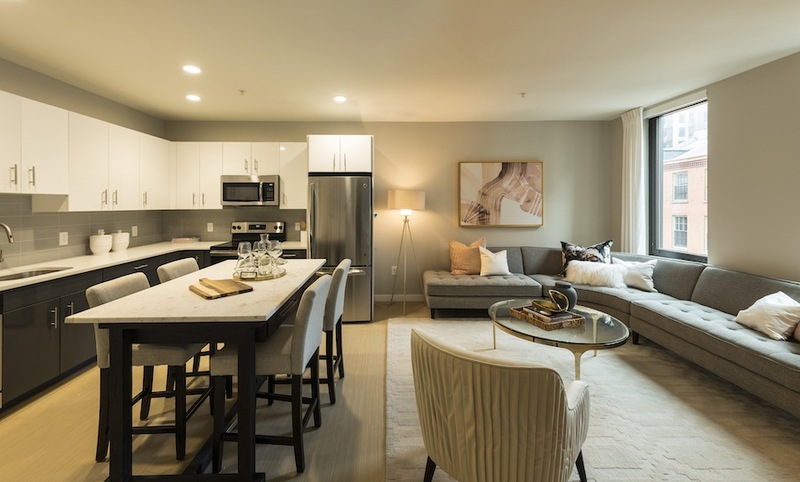 Available apartments range in size from 509 to 1,043 square feet and rent for $1,735 to $3,375 per month. Visit The National’s website for more information.